For the best value, come see our beautiful rooms! We are close to GSP International Airport and just minutes from downtown Greenville. We have clean rooms with pillow top bedding and hardwood style flooring. No musty smelling carpets! We offer Sleep and Fly packages which include your shuttle both ways, 1 room night and parking for up to 2 weeks. We have a hot continental breakfast and friendly staff to assist you. 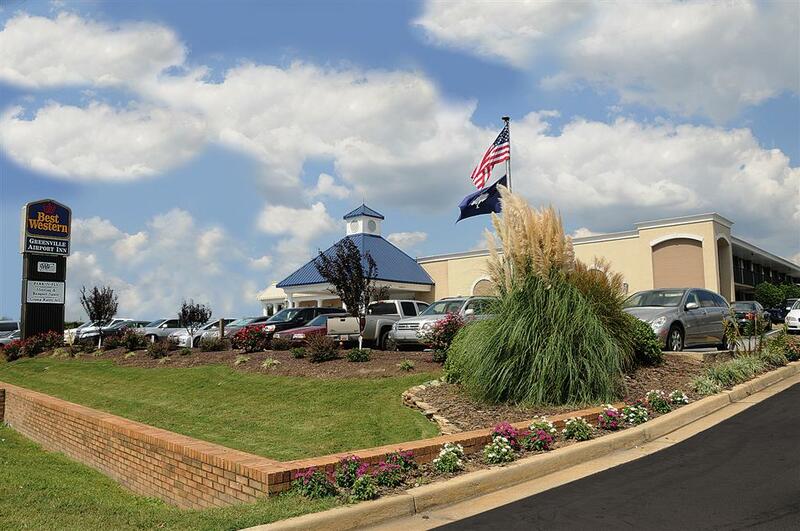 From our Best Western you will have easy access on and off Interstate 85 and at least 2 dozen restaurants right on our Exit 54, Pelham Road. Make a quick trip to downtown Greenville and see our lovely Reedy Falls Park. Walk out onto our Liberty suspension bridge to view the falls. Bring your camera. Its photo worthy! In less than an hour drive youll find access to many waterfalls. Just google 32 SC waterfalls for a brochure. We are located close to the South Carolina Children's Museum and Greenville Zoo, both are must-see attractions. Take a trip to the BMW Museum for a fascinating family trip, or check out Reedy Falls to get back in touch with nature. Whether you want your trip to be cultural, adventurous or a learning experience, why not have it all? This Greenville hotel is popular with business travelers. The BMW plant, Synnex, Scansource , General Electric (GE), Bausch and Lomb, Michelin headquarters, Fluor Daniel and many more frequently bring out of town employees to the area. We are near the Tyger River Sports Complex and often host ball teams for that venue and others in the area. Our rooms are spacious and perfect for a small family. Enjoy easy Internet access and easy interstate access. There's less time commuting and more time experiencing everything South Carolina has to offer. Our friendly staff members make your stay even more special, as we're dedicated to the comfort of each guest. Friendly staff, reasonable rates and comfortable amenities. Book your upcoming room at Best Western Greenville Airport Inn. From: The north. Take Interstate 85 to Exit 54, Pelham Road. Make a left hand turn. The Best Western Greenville Airport Inn is .1 miles on the left. From: The south. Take Interstate 85 to Exit 54, Pelham Road. Make a right hand turn. The Best Western Greenville Airport Inn is .1 miles on the left. 2.00 mile(s) from Acropolis Restaurant, bar/lounge, Greek, open for: lunch, dinner, Greek and Italian, Monday through Saturday, 11:00 a.m. to 11:00 p.m. Pool - Outdoor pool Outdoor Pool- Seasonal. Open 8am-9pm daily. 3.00 mile(s) from Hollywood 20 Movies, exit 51C then right. On your right on Woodruff Rd. You're bound to find a good movie and hot popcorn for everyone in this large facility. 10.30 mile(s) from Peace Center, great Shows! 11.30 mile(s) from Discovery Island, join us for a day of fun at Discovery Island Waterpark, South Carolina's award winning aquatic facility. 9.80 mile(s) from Greenville Zoo, enjoy wildlife from around the world, including giraffes, orangutans, giant tortoises, lions and of course, everyone's favorites, Joy and Ladybird, the elephants. 7.90 mile(s) from Cross Winds Golf Club, a par 3 golf course at 61 Villa Rd Greenville SC 29615. Tell them Best Western sent you! 11.30 mile(s) from Greenville Drive Baseball, come see why Fluor Field at the West End was chosen as the 2006 Ballpark of the Year and why the Greenville Drive is known as the home for affordable family fun and entertainment! 9.90 mile(s) from Bi-Lo Center, check out the hot shows. 10.00 mile(s) from Reedy River Falls Park, today the historic park features scenic overlooks, nature trails, a land bridge, six abundant garden areas and two waterfalls. "America's Stonehenge" of the South, financed by a wealthy, nameless, mysterious stranger.